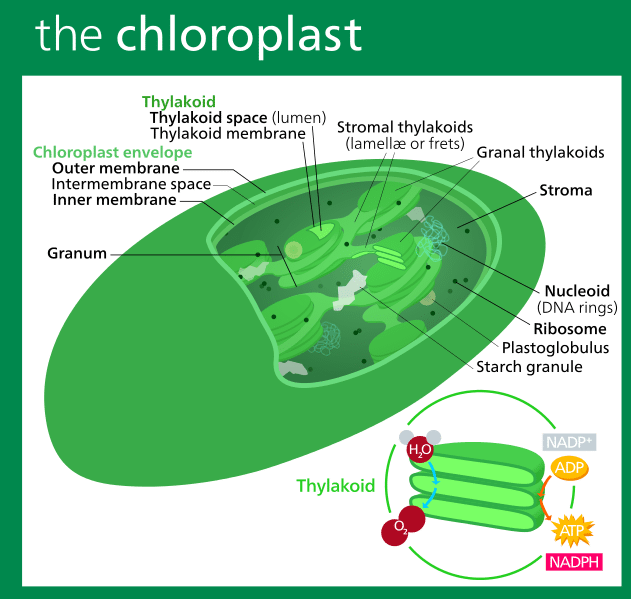 Chloroplasts are cell organelles found only within the cells of plants and algae. The function of chloroplasts is to produce energy for the cell through the process of photosynthesis. The chloroplasts of a cell are filled with a pigment called chlorophyll which captures the energy in certain wavelengths of light. This pigment is also what is responsible for plants and algae having their green color. That’s the basic definition of chloroplasts, but it would be helpful to place chloroplasts in their context within the cell and go into more detail about the organelle. The chloroplast in a plant cell serves a similar function to the mitochondrion found in animal cells, providing the cell with energy. Also, like the mitochondrion, chloroplasts are theorized to have evolved from bacteria that were once free-living. Chloroplasts create energy for the cell by converting light energy into stored energy. The energy that comes from sunlight is captured by the chloroplasts and stored as either sugar or other organic molecules, which the cell will use as food. Chloroplasts have chlorophyll within them, and this is what captures wavelengths of sunlight to create adenosine triphosphate, or ATP, the format energy is stored in within the cell. Chlorophyll and another pigment known as carotenoids can also form nicotinamide adenine dinucleotide phosphate, or NADPH, which is responsible for carrying elections around. The second phase of converting light into stored energy is known as the Calvin cycle, where the electrons that are transported by NAPDH are utilized to turn carbon dioxide into an organic molecule – a carbohydrate. This process is known as Co2 fixation. The organic molecules that this process create are stored for later use as energy. Chloroplasts are oval-shaped organelles with two membranes, similar to mitochondria. The inner membrane of the chloroplasts is referred to as the stoma and is has small sacs dubbed thylakoids, which increase the surface area of the cell, much like mitochondria have folds called cisternae that do the same. Thykaloids are stacked on top of one another in vascular plants, creating a structure called a granum. The thylakoids are what contains the carotenoids and chlorophylls of the chloroplasts. These pigments work alongside other molecules to form systems known as photosystems. A region of the chloroplasts called the stroma is responsible for producing the complex organic molecules known as carbohydrates. The stroma also contains chunks of DNA and ribosomes, which is one of the reasons that chloroplasts are theorized to have evolved from free-living bacteria. The theory that chloroplasts were once free-living cells is called the endosymbiotic theory and it hypothesizes that the cyanobacteria that were precursors to chloroplasts had a symbiotic relationship with cells (making energy for the cells in return for a safe environment) and that they eventually evolved into a form that depended upon the rest of the plant cell to live. Not only do chloroplasts have their own DNA, new chloroplasts are created through the process of binary fission, which is how bacteria reproduce. Unlike mitochondria, however, chloroplasts are theorized to have evolved from cyanobacteria while mitochondria are thought to have evolved from aerobic bacteria. 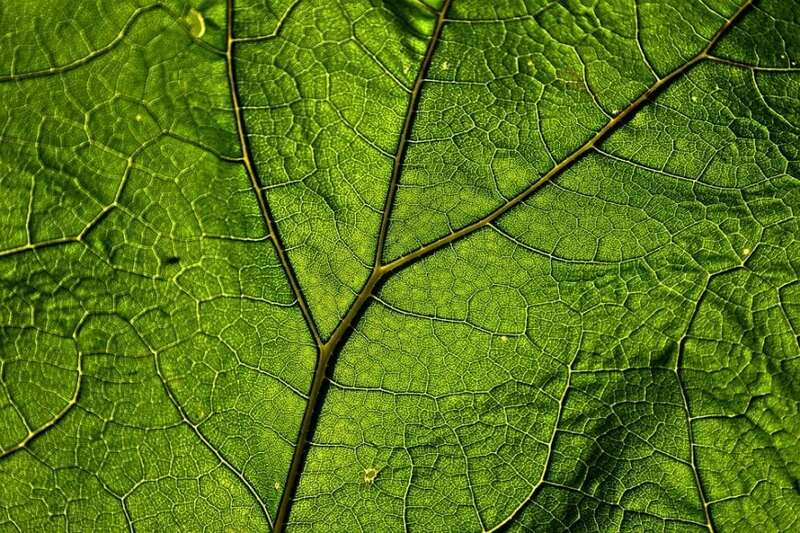 The photosynthetic process involves four different chemical reactants: glucose, oxygen, carbon dioxide and water. Plants take in water and carbon dioxide from the environment and use these chemical reactants to turn sunlight into energy. As a byproduct of the photosynthetic process, plants give off a oxygen and create glucose. The photosynthetic process is part of the carbon cycle, and the things that plants produce – glucose and oxygen – are used by animals (who can’t photosynthesize) to sustain themselves. Animals consume plants to obtain food and breath oxygen, giving off carbon dioxide when they respirate, which plants use to create more oxygen and glucose. This system is responsible for driving the massive variety of life we see here on Earth. While the chloroplasts play a key role in providing energy to plant cells, mitochondria fulfill that role in animal cells, taking glucose and transforming into ATP. Different plants are capable of absorbing different wavelengths of light utilizing various pigments. While most plants are green, the coloring arising from the chlorophylls in the chloroplasts of the plant, there are other pigments like carotenoids and phycobilins that absorb different portions of the light spectrum and these other pigments give plants various colors. Carotenoids are colored red, orange or yellow, and they absorb live in the blue/green wavelengths. Carotenoids are how carrots get their orange colors. By contrast, phycobilins are either blue or red, and they absorb the wavelengths of light outside of red, orange and blue. Red algae and cyanobacteria are examples of organisms which use phycobilins. The chloroplast is only one part of a plant cell. 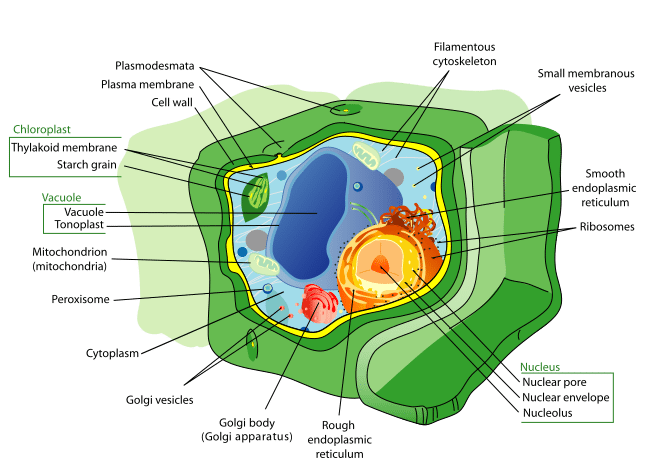 The other parts of the plant cell include: the cell Wall, the Plasma Membrane, the Cytoplasm and Cytoskeleton, the Nucleus, the Endoplasmic Reticulum, the Golgi Body, the Mitochondria, Peroxisomes, Ribosomes, and Vacuoles. The cell wall gives protection to the cell and it is rigid enough to support the cell, yet permeable so materials can move in and out of the cell. The plasma membrane contains the contents of the cell inside it, like the cytoplasm, in it and it is also semi-permeable. The cytoplasm consists of a gelatine-like substance that holds materials vital for the survival of the cell, like salt and enzymes. The nucleus is sometimes the “brain” of the cell and it controls the cell’s growth and reproduction. The endoplasmic reticulum is responsible for producing and transporting lipids throughout the cell. The Golgi apparatus, or Golgi body, is an organelle that handles the manufacturing and shipping of lipids and proteins to other parts of the cell for use. Mitochondria are referred to as the “powerhouse” of the cell because they are involved in the production of energy, and plants have them in addition to chloroplasts. Ribosomes synthesize proteins for the cell while vacuoles are containers wich transport, detoxify and protect the cell.